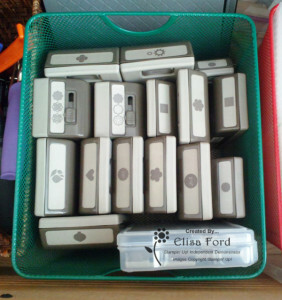 In this sixth post in my “Storage Series” I share how I store my craft punches. I LOVE storing my punches like this! I stole the idea from another demonstrator years ago. I especially appreciate how easy they are to access and see what I have. I have labeled each pocket, just so I can be sure to put the punches back where they belong. My newer body style punches are stored in my top dresser drawer in another wire basket from the dollar area at Target. My smallest punches are inside (you guessed it!) another Iris container! I will likely outgrow this storage space and need to resort to another plan soon. I’m actually considering re-doing my entire craft area in order to maximize space and attempt to keep ALL of my supplies in my craft room so that I won’t have to run between the craft area and my office to get supplies. I’ve seen a bunch of really great storage for punches. How do YOU store your punches? Tell us in the comments! I sincerely hope you’ve enjoyed my “Storage Series” and learned some new ideas. I’ll update as I make changes. As I’ve said before, you have to work with the space you have and the ideas that work best for you, your space, and your budget. Let me know if you have any questions! 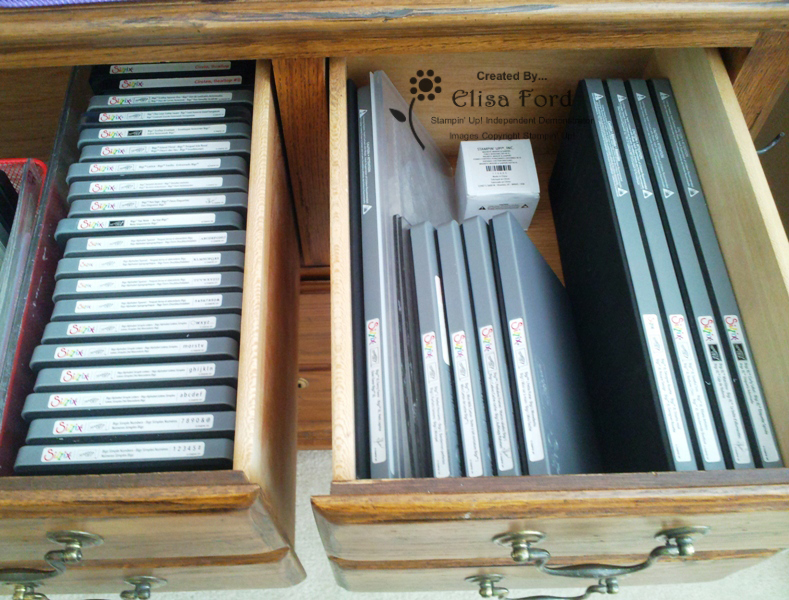 In this fifth post in my “Storage Series” I share how I store my Big Shot Die-Cutting machine, dies & embossing folders. My Bigz Dies all live in two top drawers of the dresser to the side of my craft table. On the far right I keep my longer dies and the extended cutting plates that go with them. 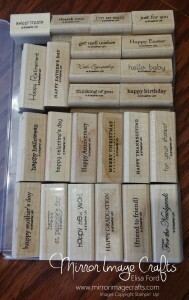 On the right side of the the middle drawer I keep all my standard sized dies and their coordinating cutting plates. 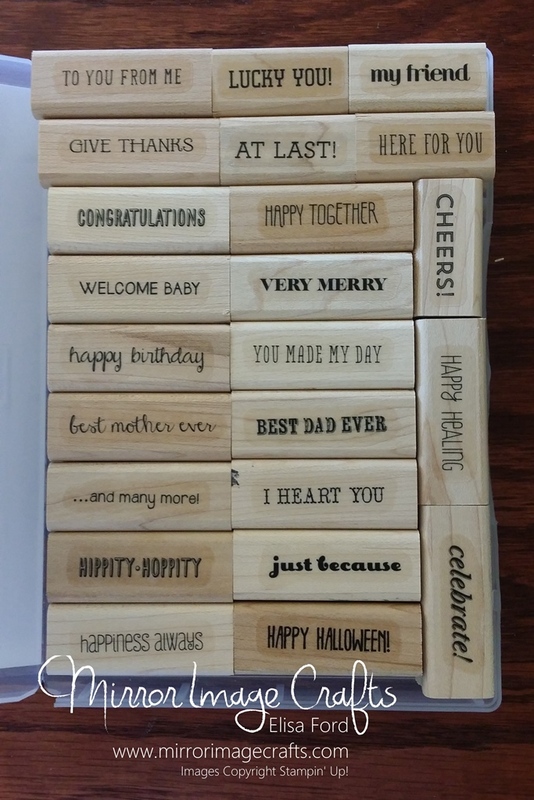 Just to the right of my dies, in a handy-dandy basket from the dollar area at Target, I keep my Embosslits, Framelits, Sizzlits, and Embossing Folders. 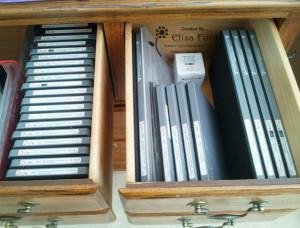 The Embossing Folders are on the left side, facing sideways. My smaller items (Sizzlits and Embosslits) are in the Iris containers I have mentioned before. 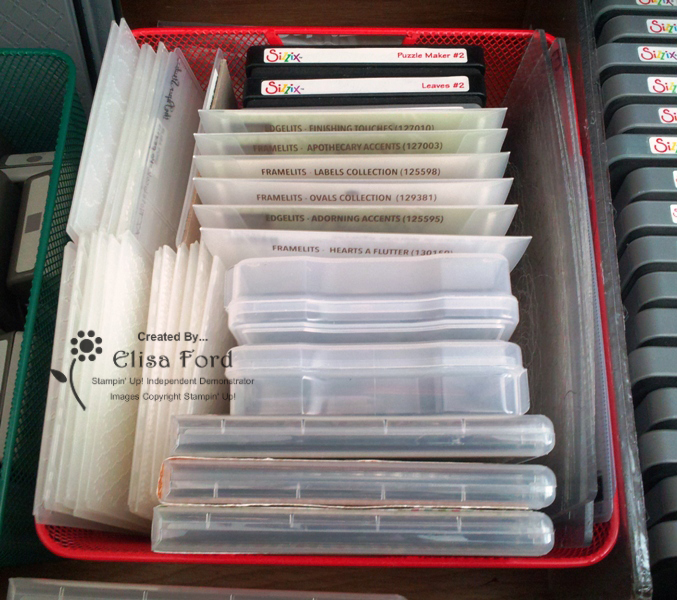 I keep all of my packaging for my Framelits (in case I need them someday) but I do take them out of the packaging and store them in these DVD cases (clear-mount stamp storage) that you can buy in a 4 pack from Stampin’ Up! I have decorated the outside of the cases with designer series paper, but you could also make a cute insert in MDS. I plan to do that at a later date. 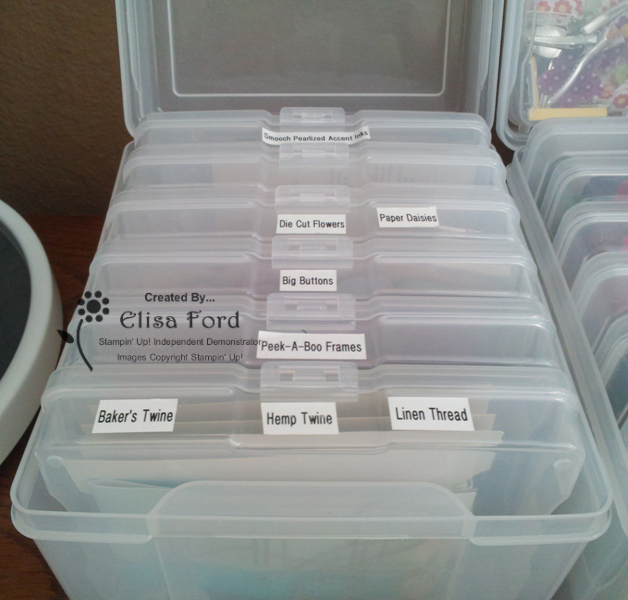 Do YOU have lots of dies and embossing folders? Share your storage ideas in the comments below. And, as always, let me know if you have any questions! 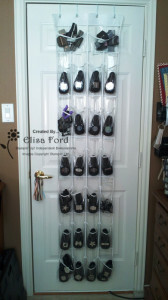 In this fourth post in my “Storage Series” I share how I store all of my paper crafting embellishments. 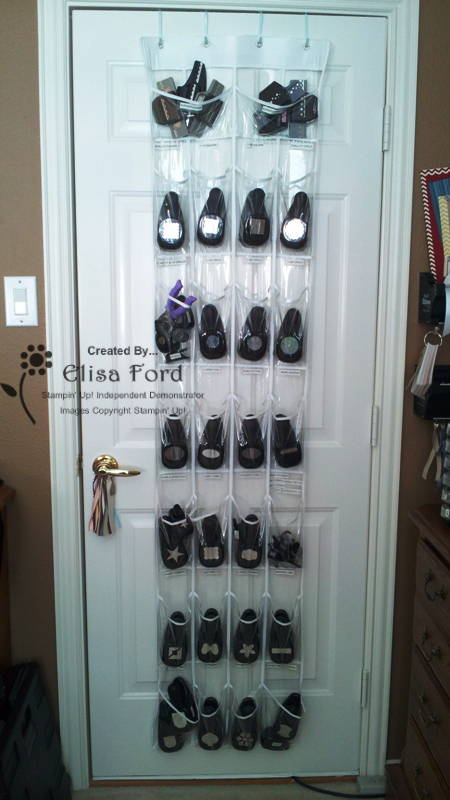 First, my ribbon is kept in these cool ribbon trays mounted on my wall. I’d tell you more about them, but I’m pretty sure they are no longer available. 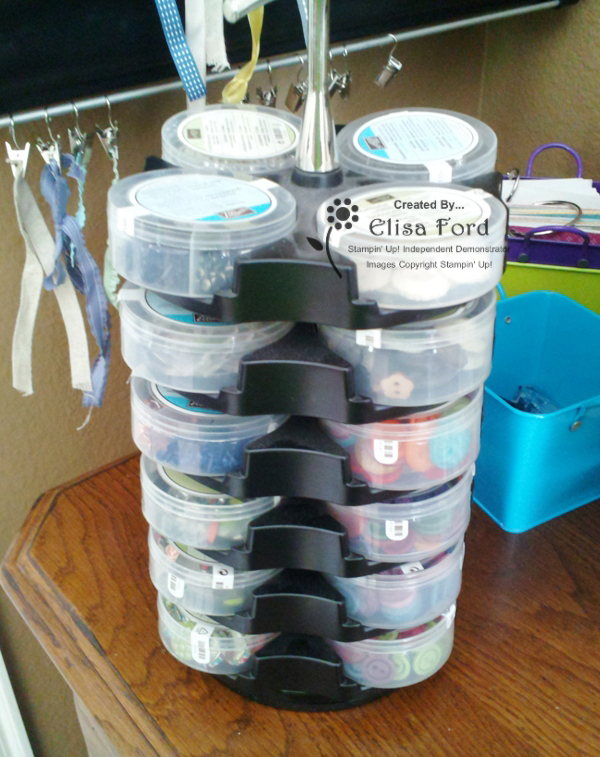 I wanted ribbon storage that was NOT on a spool, so I wouldn’t have to UN-SPOOL everything just to take ribbon to my craft table or to a workshop! I have two of them (which I will eventually fill, I’m sure) but I really don’t have much in there yet. 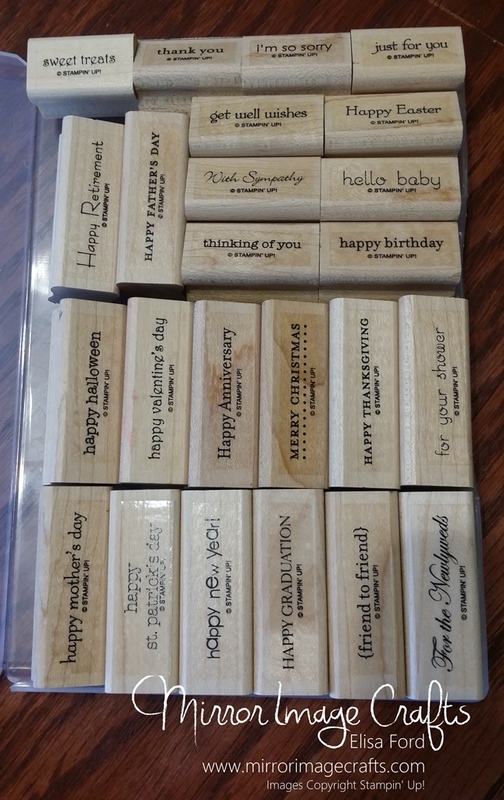 I keep my current Stampin’ Up! 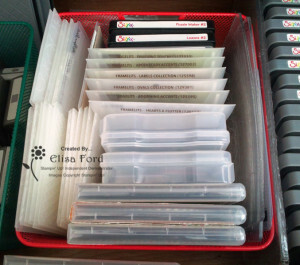 ribbon, ATG refills, and (for now) my StazOn ink in the bottom tray. The top tray (not shown) has all my retired SU ribbons, and a couple of non-Stampin’ Up! items. 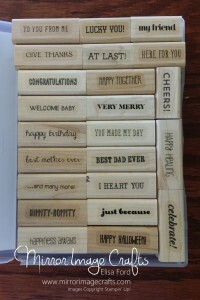 Second, I have the Stack and Store Caddy from Stampin’ Up! I love this item. It holds all of my buttons, brads, and other small embellishments in the containers they come in. I haven’t quite filled this up, but I am working on it! Finally, I keep some items in these fantastic containers from Iris. They are designed to hold 4×6 photos, but I rarely use them for that. Instead you’ll find my rhinestones & pearls, baker’s twine, large buttons (too big for the Caddy) and other doo-dads that fit into the boxes. Then I keep them in the bigger box on my dresser, labels up, so I can easily find what I need! So, that is about it for my embellishments! 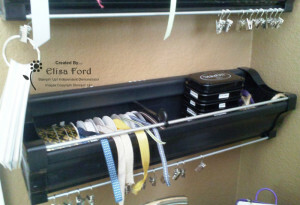 I really don’t have a bunch, as you can see, but I’ve designed my storage to be able to accommodate additional supplies. I’d love to hear how you store your embellishments (in the comments! ), or ask me any questions you might have!